Kudumiyanmalai is a great historic centre which is confirmed through the presence of the huge temple complex and its copious inscriptions. It is noted for its millennium old monuments viz., the rock cut cave temple Thirumerrali, structural shrine for God Sighanathar and the celebrated Musical Inscriptions. The inscriptions picture the place as a great centre of socio-cultural activities. It is understood from the inscriptions that the structural shrine is also an oldest establishment, either contemporary to rock cut cave or even prior to it. The etymology of the term ‘Kudumiyanmalai’ is traced from the interesting legend on the presiding deity of the temple, ‘Sighanathar’ which means ‘deity with tuft of hair’. The Sanskrit term ‘Sigha’ denotes ‘hair’ and gradually in local dialect the term was customized as Kudumiyan-malai. The main entrance to the complex is on the east with massive wall encompassing it. Straight to the entrance a mandapa and a Nandi is arranged consecutively. Though the temple complex has a single encompassed wall outside, inside it is divided into two complexes. 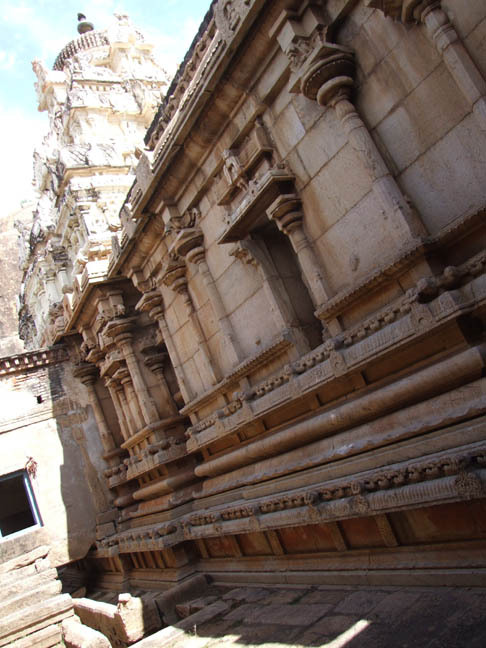 The Sighanatha shrine forms the core of the front complex with many later establishments like a shrine for goddess, sub-shrines, kitchen and huge mandapas around and in front of it forming a group. As a backdrop to this complex is the massive hillock with rock cut shrine in it and mandapas in front of it. In addition, structural shrine for Goddess and Ganesa also forms part of this complex. On the slope of the hillock in its half way a cleft is seen and above the cleft the bas-relief figures of sixty four Nayanmars with the Siva and Parvathi seated on the Nandi in the center is seen. The main entrance of the temple has no gopura. On either side of the entrance a pillared porch in a high platform is seen. The porches are closed provisions in which the left side one is functioning as the ASI office. The main entrance leads us to a pillared passage. The colonnade has six rows of massive pillars with three rows on each side. The middle two rows which flank the passage are heavy and adorned with giant sculptures. Various incarnations of Vishnu forms the theme in which Narasimha, Varaha, Macha, Kurma and sculptures like Hanuman, parrot with a rider on its back, pouncing horse with soldier on its back adorns the pillars. Beyond the colonnade on either side is seen the thousand pillared mandapas.5 On the southern side of this prakara is seen the temple tank. The next gopura entrance leads us to the Anivettikkal Mandapa or the Vasantha mandapa which is noted for its sculptural treat. The gopura is a seven tier structure with sala sikhara and also adorned with giant dvarapalas. In the mandapa on either side of the passage three rows of pillars are shown. 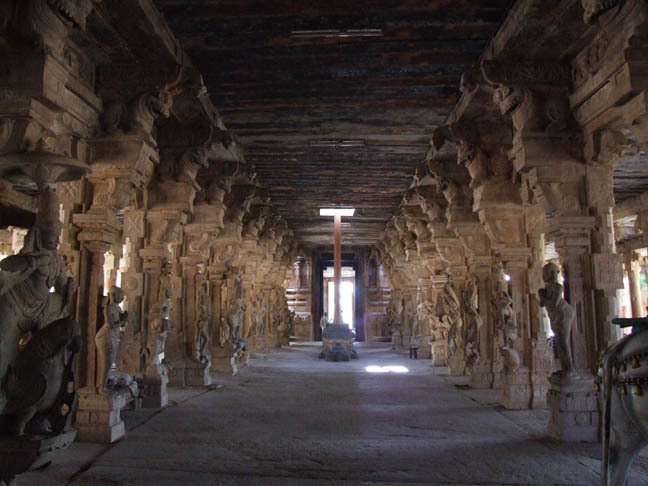 The middle rows that flank the passage is adorned with richly carved sculptures. 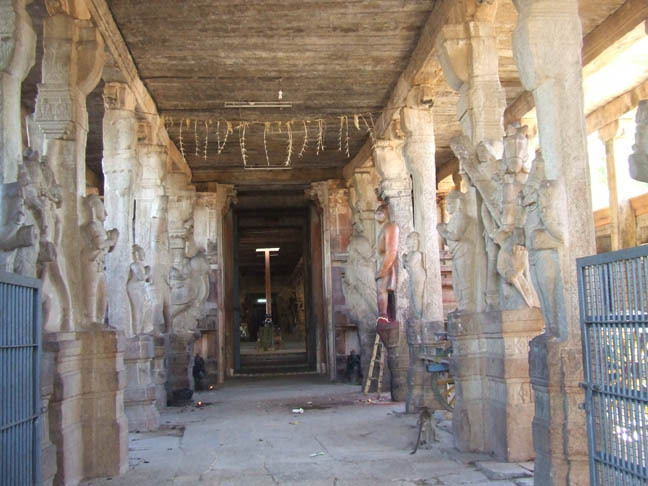 Unlike the sculptures of the outer mandapa the sculptures of the inner mandapa are life size and artistic. The sculptures of Ganesa, Ravana, Mohini, Subramanya, Narasimha in the act of tearing the entrails of Hiranya, Rama, Siva in urthava pose, Veerabhadra, Vishnu, Rati, Manmatha, portraits of chiefs are seen. The dvajastamba, Nandi and balithala are oriented towards the central shrine. 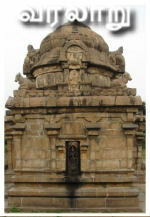 On the northern side of this prakara is seen a dilapidated mandapa facing south and a passage to the second prakara of the Sighanatha shrine. On the southern side a kitchen and a doorway to the temple tank is seen. This sculptural passage leads to the Sighanatha shrine. The third entrance is a single tier structure adorned with doorkeepers. 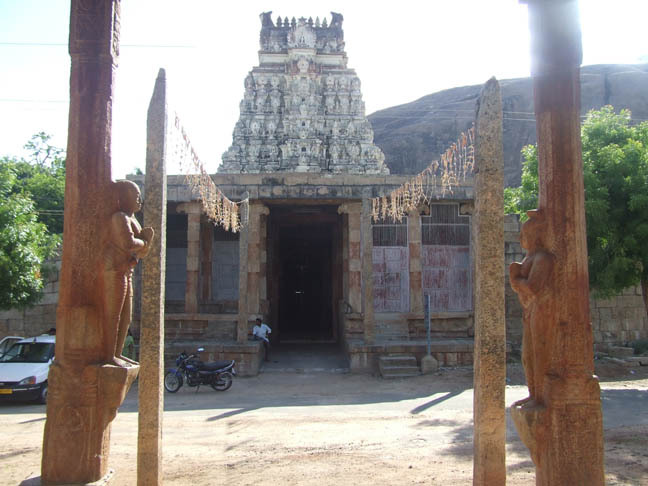 The Sighanatha shrine consists of a pillared mahamandapa, mukha mandapa, ardhamandapa and the vimana in consecutive arrangement with a thiruchutrumalika around these. The entire structure of the Central shrine with its mandpas is lying on a upapitha. The vimana of the Sighanatha shrine is three tier dravida vimana with vesara shikara. Sub-shrines and loose sculptures adorn the thiruchutrumalika. Sculptures of saptamathas, Jyeshta, Mahalakshmi, various forms of Lingas are kept here. A small underground chamber is also seen in the mukhamandapa. An exit in the northern side in this prakara leads us to the second prakara of the Sighanatha shrine. On the northwest corner of the second prakara is seen the Akilandeshwari shrine facing east whereas another shrine with stucco embellishment facing south is seen in front of the Akilandeshwari shrine. An empty sanctum and a huge open mandapa are seen in the southwest corner of this prakara. All the above said structures constitute the Sighanatha swami temple complex. 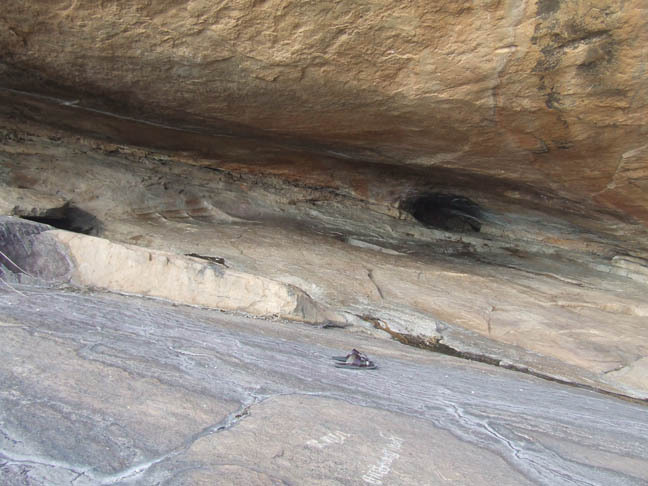 A door way on the rear wall of the second prakara leads us to the rock cut shrine. 1. Field visits 27-09-2008, 22-02-2009, 18-04-2009, 14-06-2009. 3. Commissioner of Museums, Manual of The Pudukkottai State,Vol II. Part II, [K.R.Venkatarama Ayyar, (Editor)] Government of Tamil Nadu, 2002. P.1047. 4. சு.இராசவேல், அ.கி.சேஷாத்ரி, தமிழ்நாட்டுக் குடைவரைக் கோயில்கள் (Cave Temples of Tamil Nadu), பண்பாட்டு வெளியீட்டகம், சென்னை, 2000. 'குகையின் தரைப்பகுதியில் தமிழி எழுத்துப் பொறிப்பு கொண்ட கல்வெட்டு ஒன்று காணப்படுகிறது. மேலும் இதன் அருகில் வரலாற்றுக்கு முற்பட்ட கால ஓவியங்களின் எச்சங்கள் காணப்படுகின்றன'. P:170. Only inscription is seen, no trace of paintings. 5. But only 154 pillars are seen on each side.